Machu Picchu - The most Incredible place on earth. Machu Picchu is ranked as the number one place to see in the world. Airline prices available, click here for cheap tickets to Peru! Machu Picchu, located 50 miles northwest of Cusco, Peru, is one of the greatest man made wonders in one of the most beautiful settings in the world. This Peruvian national treasure is situated high between two mountain peaks offering breathtaking vistas of the mountain area and of the Urubamba River, 2000 feet below the ruins. Machu Picchu are the most spectacular archaeological ruins in the Western Hemisphere. Considered a very spiritual place the world over, countless International travelers make their pilgrimage to this unique locale to experience its incredible surroundings and marvel at Inca know-how pertaining to constructing this mountain city without modern technology. 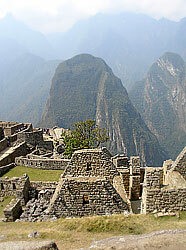 Machu Picchu is an engineering feat on par with the Pyramids of Egypt or the Coliseum in Rome. The structures were built with expert cutting ability with stones placed so close together a quarter could not pass through them. Translated as old peak, Machu Picchu may have been a sanctuary in the mountains for Inca leader Pachacuti Yupanqui who reigned during its construction between 1460 and 1470. It also could have been used for religious purposes. 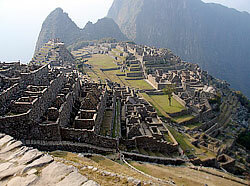 Machu Picchu contains 200 buildings of temples, storage facilities, and housing. The town was ignored by the Spanish during their conquest of the Incas and forgotten for almost 400 years until the early 20th century. 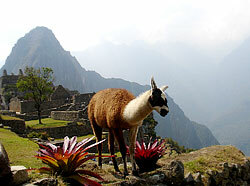 While at Machu Picchu expect to see one of Peru's national symbols, the llama. Llamas are curious creatures who are not shy around humans and will typically come close to individuals and smell them. They are peaceful, intelligent and typically used during the Inca period and since as pack animals. Machu Picchu is not a heavily visited tourist site with only 400,000 visitors per year, but it is just awe-inspiring as the Grand Canyon. This is Peru's must-see destination and should be visited at least once during a lifetime. Nearby Cusco is the oldest city in the Western Hemisphere that still exits. This 3,000 year old city was the capital of the Inca empire and is currently a thriving city of several hundred thousand residents. Cusco offers hotels, restaurants, and museums galore. Some of the landmarks of the city are the Inca palaces, the grand Cusco Cathedral, and the Main Square where many historical events have occurred throughout the city's history. 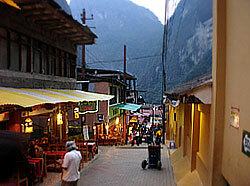 The Scared Valley is also an area with impressive Inca ruins and unparalleled beauty. It was also a center of corn production. The fascinating villages of Pisac, Urubamba, and Ollantaytambo can be visited during a day trip from Cusco. 6 hour hike to Huayna Pichu ruins. Please make sure to send us a copy of your passport as soon as possible after you sign up for the tour. The departure flight from Cusco to Lima on the final tour day will not arrive in Lima until 4:15PM that Sunday. Therefore, schedule your flight from Lima to your home airport at 7PM or later Sunday.